In health care, caregivers heal with their hands, says Proventix Systems CEO Harvey Nix. That is why the company has partnered with the University of Chicago Medical Center to pilot an RFID-enabled hand-hygiene quality and compliance monitoring system. 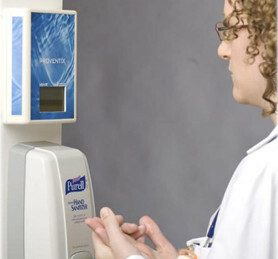 Proventix will install its nGage touchless monitoring system to track hand hygiene compliance at the academic medical center, 24-hours-a-day, 7-days-a-week. 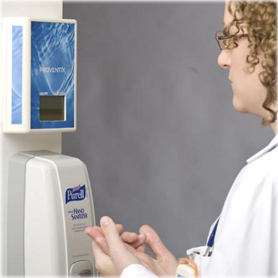 It will do so through RFID badges worn by caregivers that monitor hand-hygiene events upon entering and exiting a patient room. Automated monitoring allows the health care facility to collect data to know which workers comply, how often compliance happens and which dispensers are used. This information can then be used to determine correlations between hand hygiene events and health care-associated infections, thereby reducing he risk for spread of infections.